The Shock Doctor ICE Recovery Compression Knee Wrap is revolutionary icing therapy for knee sprains, sore knees after running, knee tendonitis, ACL/MCL, or other knee injuries. The wrap fully surrounds the joint and works like professional icing, while being easy to use and less messy than bags of ice. 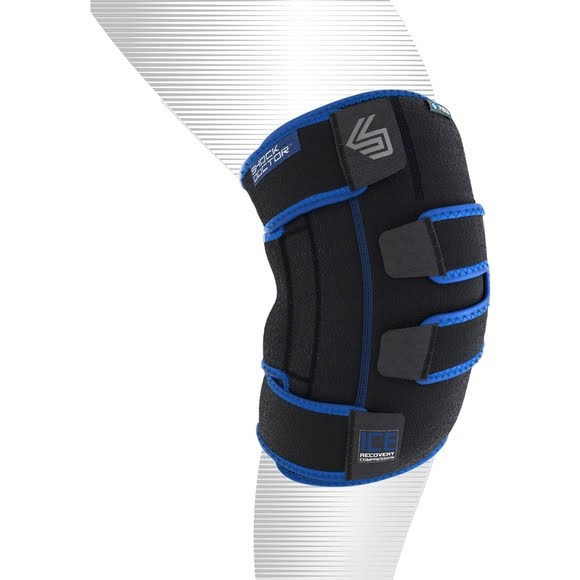 The Shock Doctor ICE Recovery Compression Knee Wrap is revolutionary icing therapy for knee sprains, sore knees after running, knee tendonitis, ACL/MCL, or other knee injuries. The wrap fully surrounds the joint and works like professional icing, while being easy to use and less messy than bags of ice. The penetrating therapy helps reduce swelling and pain by extracting heat from the knee through gentle compression and deep 360 degree ice coverage. This cools the knee faster and helps speed the body&apos;s natural ability to heal. The Gel Packs can be heated if desired. Allows you to easily insert and remove gel packs. Compression wrap fully surrounds the ankle, top of foot and instep and provides deep cooling to help the body&apos;s natural ability to heal. Can be used as a heat pack. Follow instructions on Gel Pack. Gel packs can be used either frozen or heated giving athletes the most complete solution. Real ice can&apos;t do that! Provides customized fit, preferred compression and keeps wrap in place for convenient easy use.